All by themselves apple cider vinegar and honey are doing great in preventing and/or healing some of the most common diseases. But well being is not just lack of disease, it’s also having a healthy and strong body and mind. The question is – how to do that? Well, the answer may be found in the combination of these two ingredients – apple cider vinegar and honey. Honey alongside apple cider vinegar – that’s a really remarkable combination with many significant health benefits. What I am talking about is that this amazing apple cider vinegar and honey drink might turn out to be the answer of our hopes and struggle for pure, cheap and yet effective aid to well being. This all natural drink provides a whole new level of endless possibilities and possible solutions for all holistic conscious people all around the globe. digestion problems such as loss of appetite, acidity, ets. In fact if you sit down a think about it – apple cider vinegar and honey aids, heals or prevents a lot more diseases and bad health conditions that you know. It works fast every time, not that I need it very often now… To tell you the truth i hardly have any headaches after 7 months of taking this drink, nor have suffered sore throat, which i am absolutely sure I owe to this miraculous drink. How to prepare the apple cider vinegar and honey drink for weight loss? Mix it all together and stir until honey dissolves. How often should I take it to lose weight? Take 1-2 sips of the apple cider vinegar and honey weight loss drink 15 minutes before every meal you eat throughout the day. How does it work to help you lose weight? That a very good question. It acts as an appetite suppressant. Burns fats and reduces cellulite. 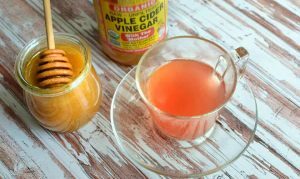 Is the recipe for apple cider vinegar and honey drink for weight loss different from the one taken for other ailments? Yes, it differs in ingredients proportions. More ways to prepare and use the apple cider vinegar and honey drink – in my next post. please help me. how much of this apple cider vinegar and honey should I use on a 6 year old child? None! This drink is for Adults only! @LEBOGANG, Please don’t use it on a 6 year old kid.